After an extremely warm end to last week and the weekend, we have finally dropped back down into a fall to winter-like pattern. Temperatures are expected to remain below average through the entire week with rain chances coming towards the weekend. Dry conditions will remain for the first half of the week with some sunshine expected by midweek. We will continue to transition back into our colder spell over the next few days with high temperatures slowly falling through the 40s. While today's high will be in the upper 40s, Tuesday and Wednesday's highs will be in the lower to mid 40s. Clouds will begin to increase today and hang around a bit longer tomorrow. However, by Wednesday skies will begin to clear to introduce more sunshine to our weather pattern. Luckily, we are not expecting any rain over the next few days. Overnight temperatures will fall to near freezing tonight, with temps dipping down into the upper 20s to lower 30s Tuesday and Wednesday nights. If you haven't already, you may want to pull out the extra blankets and turn on the heat once again. Our dry spell could only last so long as rain chances are re-introduced Thursday evening. We should make it through the majority of the day with partly sunny skies and highs in the upper 40s. Scattered shower chances will begin to increase into the evening to overnight hours with additional showers possible on Friday. Light rain is expected to continue into Friday, helping to keep high temperatures in the lower 40s. Showers shouldn't be too heavy, but heavy enough that you may want to keep the umbrella handy Friday to keep the cold, drizzle away. Rain and cooler temperatures are expected to continue into this weekend. Highs are expected to be in the upper 30s to near 40 both Saturday and Sunday with overnight temperatures falling near to below freezing. Saturday looks pretty gross if you ask me with a cold rain expected through a good portion of the day. While we are several days out, we will need to continue to keep an eye on things for Saturday night. Temperatures may become just cold enough to allow for some flakes to mix in on Saturday night. This is still only a possibility, but worth mentioning. Moisture from Saturday's showers may move out earlier than expected, which would eliminate this wintry mix potential. However, the chance still remains for now. We will keep an eye on this through the remainder of the week, and will provide additional information as we draw closer to the weekend. 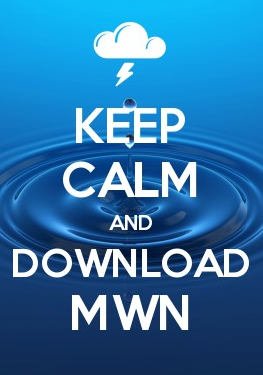 You can check our latest thinking in the MWN Forecast anytime via the web or our mobile app (links provided below).